Because I want super style and a beach within reach. Looking for something with plenty of Valencia charm, just a short stroll from the beach? You'll love this one then. You will love the stylish decor. What is it about exposed brick? It's chic, fashionably furnished, and has a cool big clock. The time is right for this pretty pad. We think it’s ideal for a professional couple. Start your day with a swim, then head into the city for some fun. The Metro is handy and central Valencia is only a short trip away. The terrace. Love the cute pot plants. The stylish decor. Love those exposed wooden beams. The location. Walk to the El Cabanyal in 10 minutes. The bedroom isn't completely isolated from the living area. There are walls and a curtain door, but no ceiling. Unique! 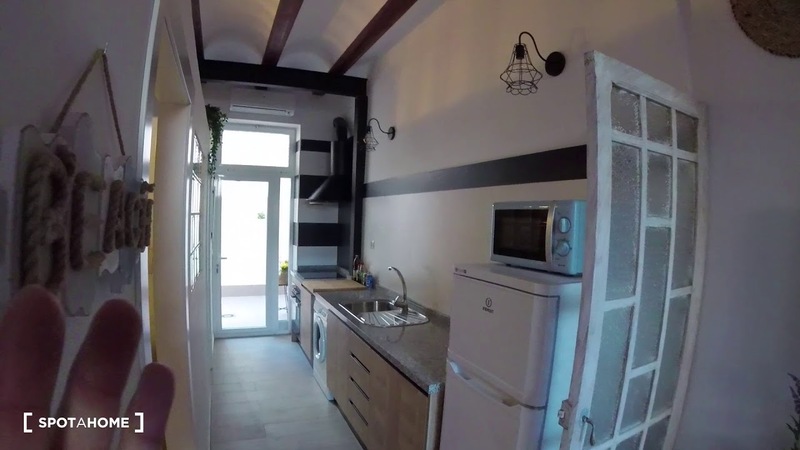 This is a stylish ground floor, 1-bedroom apartment on Carrer D'Escalante, Valencia. It boasts a chic decor, a semi-independent bedroom, and a cute terrace with a table and chairs. We think this apartment is ideal for students or professionals. Grab yourself a spot in one of Valencia's trendiest neighbourhoods. You'll have everything you need close by, including the beach. Enjoying your morning coffee on the terrace – start the day the right way. Relaxing in style – check out that lovely sofa. Walking to the beach – El Cabanyal for an afternoon swim? There is a washing machine but no dryer – no probs, air dry your underwear on the terrace.